The Uridan Compass waterless urinal leaves no excuse for everyone not to save water. The Uridan waterless trap ensures that no smells can come from the drain (see video). Waterless urinals must be sprayed every day with Uriclean to ensure that no urine will adhere to the fitting and cause an odour. 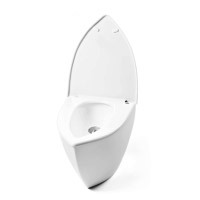 The urinal is sleek, easy to clean and very durable. Suitable for men and women.